This will be the first chip using Qualcomm's new custom ARM core, apparently called Hydra now. The leaked slides claim a 35% performance increase over the Cortex-A57 ARM reference core. 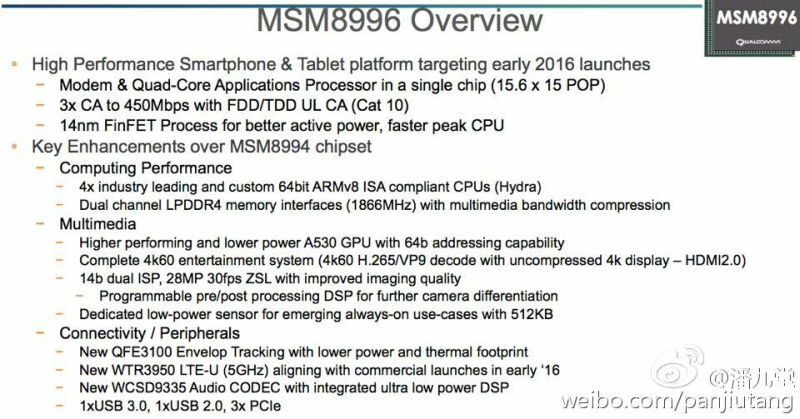 This will be a quad-core chip rather than an octa-core big.LITTLE affair like the Snapdragon 810. On the GPU side, Qualcomm is stepping up to the Adreno 530, and claims a 40% improvement in performance and 30% efficiency boost. The Snapdragon 820 will be based on a 14nm manufacturing process (810 was 20nm), which should help reduce heat at higher clock speeds. The change to custom CPU cores should also improve matters. 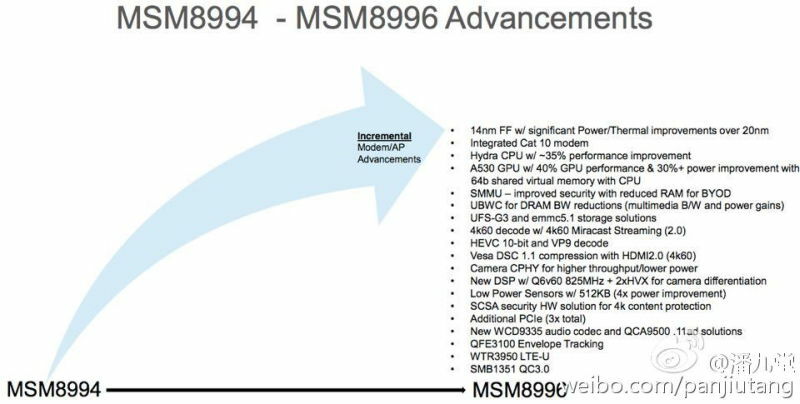 It will also support cameras up to 28MP with a programmable DSP, low-power sensors, and LPDDR4 memory. The chip is targeted for release to OEMs at the end of 2015, but don't expect it to show up in any phones until early 2016.